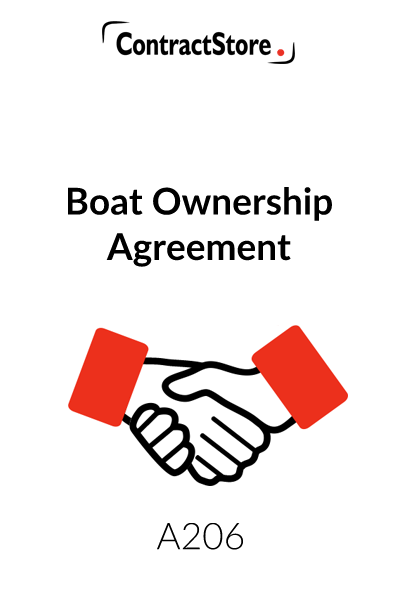 This Agreement is for joint owners of a boat who use it for leisure, and are already the owners, or who intend to purchase one together to form a new syndicate. Four Schedules are included, allowing parties to set out details of ownership, equipment, regulations and option events. This agreement is not suitable for a boat used for commercial purposes, but is suitable for a boat used for leisure purposes. 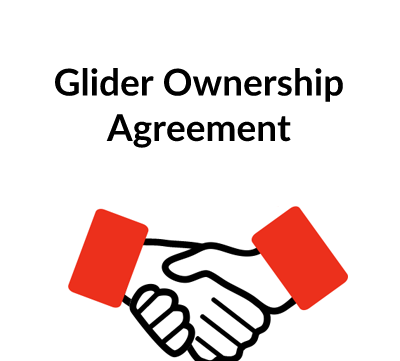 This Agreement is designed for use by the joint owners of a boat including a yacht, canal boat, cruiser, dinghy etc. when it is to be used by them for leisure activities. It should not be used if the boat is used as a business asset or for other commercial purposes. The joint owners may already be the owners or they may be planning to buy a boat together. It also covers the ownership of any equipment belonging to the boat, but which is not part of it. It deals with the terms of ownership and how the boat is to be operated with reference to regulations. It includes provisions for a formal meeting of the owners to deal with important matters, but you may think that this is not required and that an informal discussion is acceptable. In this event, the relevant provisions should be deleted. There is a pre-emption right so that, if one of the owners wishes to sell a share, then the others can purchase it. This would involve the exercise of a veto. There are also provisions for an option so that, if certain events occur in respect of one of the owners, then the others could purchase his share. The Agreement deals with how the price should be determined in both cases. If one of the events did occur, then it could well result in the sale of the boat as a whole unless the option were to be exercised. The family, for example, of a deceased owner would want to realise the value of the deceased’s share and so they could insist on a sale in any event. However, the provisions for the option would prevail to prevent this. In the unlikely event of there being a dispute between the owners, then there would be a reference to an arbitrator to find a solution. The Agreement may well require some adaptation to deal with individual cases. If you are members of a Club or Association or if the boat is moored at a marina, then there may be rules or a code of practice which should be incorporated in some way to make them binding on the owners. You may also want to refer to the British Waterways and similar bodies for guidance. The full name of the owners and their addresses should be given in the Ownership Schedule along with their percentage shares as to ownership. If the equipment is owned in different shares, then clause 5.1 should be amended and a separate note should be made in the Ownership Schedule. The boat may, of course, be registered in the name of one or more of the owners. In some cases, perhaps it is registered in the name of just one owner with the others being mentioned as owners. However, this Agreement should be completed on the basis that all the owners are mentioned in the Ownership Schedule. All these should be checked and blanks completed. You will also need to complete the details in the Equipment Schedule as well. These are what most owners will want, but you may want to adapt them to any particular case. These are set out in clause 6 and there is also the Regulations Schedule. Additional requirements can be added to the Schedule. There are also the obligations set out in clause 12. You will need to complete clause 12.1.4 to deal with what you have all agreed. There will no doubt be a syndicate bank account with one or more of the owners being responsible for it. You will need to complete the blank in clause 7.2. Under clause 7.4 accounts will be kept of all expenditure and income and the Syndicate may want to agree an annual budget. 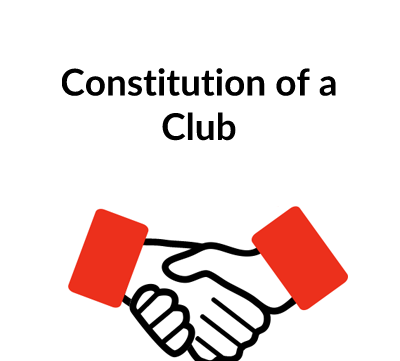 Clauses 9 and 10 will ensure that the members can in effect block an unacceptable outsider joining the syndicate. At the end of the day, the members of the syndicate want to ensure that they can enjoy their leisure activity with others they get on with. Clause 12 sets how the purchase price of a share being purchased by the other members would be determined. It may be that unfortunately a member accidentally causes damage to the aircraft or equipment. In this event, should that member have to pay for the repairs and other losses? If there is an insurance claim, then the premium may be increased on the next renewal and the no claims bonus may be lost. You will have to decide if the member concerned should pay for the increases. There are two options in clause 11.5, one of which you may want to use. Once the Agreement has been finalised, it should be signed by all the members of the syndicate and dated. 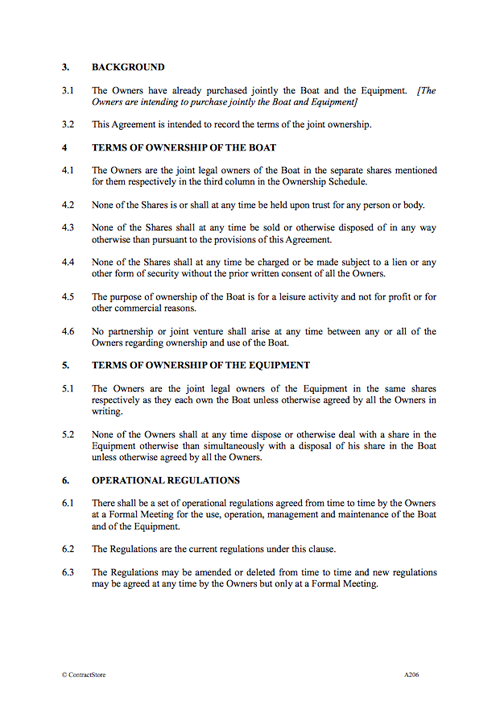 The original Agreement should be kept with the other Boat documents with each member having a copy.